Dzongsar Khyentse Rinpoche is an outstanding Buddhist teacher and director of The Cup, arguably the first great Tibetan feature film. He’s thoroughly modern and deeply concerned about corruption of the dharma. In this classic interview with his student, Kelly Roberts, from 2000, he challenges Western Buddhists to uphold the unchangeable truths of Buddhism while letting go of its cultural trappings. Too often, he says, we do the reverse. TV Photo by Sven Scheuermeier. Thangka of Mt Meru, 18th Century. Kelly Roberts: I just wanted to say that your film, The Cup, reminded me so much of you, particularly when the Coca Cola can dissolved into Manjushri. Kelly Roberts: In many places in your film, you replace traditional items with modern ones. For instance, the offering bowls on the shrine are replaced by the Coke can and the prayer flags on the roof of the monastery are replaced by a satellite dish. I’m wondering why you did this, because usually you are so worried about Buddhist tradition being corrupted. 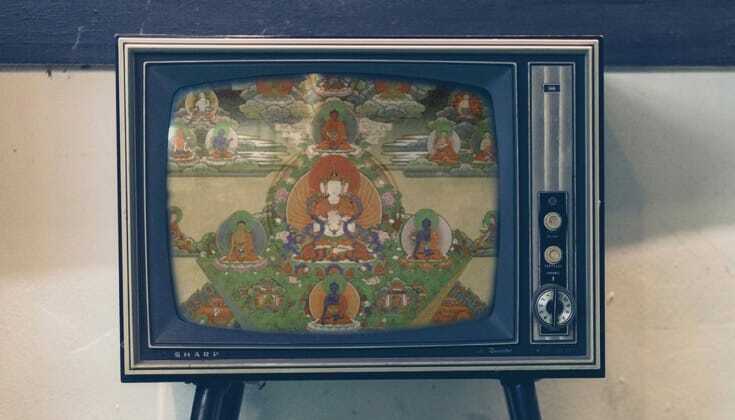 Dzongsar Khyentse Rinpoche: This is something that I want to tell my fellow Tibetans and Bhutanese—that modern technology is not a threat to so-called traditional Buddhism. Their society is just beginning to be exposed to the world of the fax, the telephone and the internet. They may feel uncomfortable with change, but the fact is we can no longer go to any place where there is no modern technology. We cannot avoid technology—it’s already at the doorstep, if not already inside our house. So instead of allowing these things to influence us, the wise thing to do is make use of their power and speed—to be the influence rather than the influenced. We can use the telephone, the web and television to teach, instead of them teaching us. We can use their power and the speed. For me, film can be modern day thangka. Kelly Roberts: You have compared your film to a modern version of a traditional thangka painting or a Buddhist statue. Dzongsar Khyentse Rinpoche: Every culture has a different way of telling a story, and I felt that maybe I should just tell a story in a Tibetan way. Kelly Roberts: Would that be your way of teaching? Dzongsar Khyentse Rinpoche: No, not at all. Buddhism has a long tradition of using images to represent wisdom and compassion. In its 2,500-year history, we can see that Buddhism has adopted many methods of expressing the dharma—through painting, sculpture, architecture, performing arts. These existed even during the Buddha’s time. 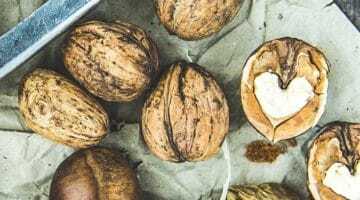 The Buddha himself in the Vinaya Sutra discusses how to paint the five realms and the twelve interdependent links as we see in the wheel of life. 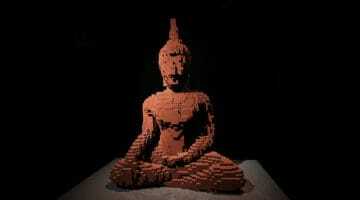 So there is an old tradition in Buddhism of using images, and film can do that, too. Why not? For me, film can be modern day thangka. Dzongsar Khyentse Rinpoche: Well, what is a thangka painting? It is an aid for your visualization. In the same way, film can help with visualization, perhaps even more effectively. For example, if you want to show what the hell realms are like, film could do that much better than a single painting. Kelly Roberts: Don’t you ever worry, though, that with modernization certain aspects of the old tradition will be lost? Dzongsar Khyentse Rinpoche: As long as the fundamental view of Buddhism is not lost, there is no problem. We may try for sentimental reasons to preserve the traditional aspects as much as possible, but they will eventually change. Don’t forget that the customs and traditions that we are trying to preserve today were once modern and progressive. Kelly Roberts: In the film, the Abbot writes about his wish that, “Nyima and Palden would continue to uphold the Buddha’s teachings according to these modern times.” What is it you’re trying to say with that? Dzongsar Khyentse Rinpoche: It doesn’t mean they will change the Buddha’s fundamental view. That should never be changed. I have met people in the West who are excessively attached to the external trappings of Buddhism. There is all this sentimental attachment to Tibetan customs and culture, and the actual Buddhist view is overlooked. In fact, I have heard that in creating a so-called “American Buddhism,” some people are saying, “Okay, maybe the Buddha’s view should be changed, now that Buddhism is in America.” And that’s not good. I would prefer that Americans really stick with the Buddha’s view: the emptiness of inherent existence, that everything composite is impermanent, and so on. It doesn’t matter if they leave out Tibetan culture. The really important thing is that they should accept the dharma. They should not worry about trying to design something better suited to Americans. The Buddha was an omniscient being. What he said was good for all sentient beings, and that includes us 2,500 years later. Nothing additional is necessary now. Do you think someone could become enlightened by playing soccer? I see Westerners wearing chubas and showing off their malas. But I think the more people do that, the more they forget the essence, the actual point of the Buddha’s teaching. It’s amazing to see how eager some people are to adopt what is not essential, and throw out what is essential! Kelly Roberts: I was a bit surprised that the Abbot would say something like this, since he is so attached to his homeland and its traditions, and doesn’t understand much about the modern ways. Dzongsar Khyentse Rinpoche: Although many of these older, experienced Tibetan teachers are attached to their homeland and might seem rigid, beneath this rigidity there is an openness. Sometimes it’s quite surprising to see certain lamas incorporating modern ways of life into the ancient Buddhist thinking, especially when you know Tibetans. Tibetans can be so narrow-minded, so racist. They have such a superiority complex. Some of them are like missionaries who go to other countries and demand that the native people learn their culture. But at the same time, teachers like Chögyam Trungpa Rinpoche created within the Tibetan wisdom lineage a space to accommodate Japanese, French, British, American ways of teaching. Kelly Roberts: You say about the monks in the movie that Buddhism is their philosophy and soccer is their religion. Do you think someone could become enlightened by playing soccer? Dzongsar Khyentse Rinpoche: You never know. Maybe. Some of the saints of the past, the mahasiddhas, achieved enlightenment by telling lies or playing flutes. So if you meet the right master, and if you have the merit, why not? Kelly Roberts: Because you’re now in the film world, you seem to have become quite famous and are living a bit in the lap of luxury. Are you getting attached to it? Dzongsar Khyentse Rinpoche: So much. I’m really going downhill! I’m getting more and more attached to this comfortable life. Even a small sesame seed in my bed bothers me. I used to travel in Indian buses, bumping along the whole night with Hindi film music blaring away, and still manage to do a lot of things the next morning. Nowadays, I might be driving in a limousine, but when things go wrong, I get very irritated. That is why I really think I need to shut myself in retreat far away in India. Don’t forget that the customs and traditions that we are trying to preserve today were once modern and progressive. Mind you, many other Rinpoches, from my impure perception, seem to be getting that way, too. They are far too attached to the comfortable life. The life of simplicity seems to be less and less important and a life of distraction seems to be getting more and more popular. Kelly Roberts: Do you tire of samsara? Dzongsar Khyentse Rinpoche: No, no, I am very much in love with samsara, not tired at all. Well, perhaps a little, thanks to years and years of being brainwashed when I was younger. The impermanence and futility of samsara does come to mind from time to time. But it only comes for nine seconds, and then it disappears for another nine months. Kelly Roberts: You have always said that of the eight worldly dharmas, you have the greatest weakness for praise. How have you worked with all the praise you have received since your film came out? Dzongsar Khyentse Rinpoche: The Buddha said that if you know a trap is a trap, you will not be caught. The Buddha is talking about mindfulness. But mindfulness is something that is foreign to me, so of course I get very much trapped by all the praise and criticism. Having said that, my gurus are very special, and I always say that if I do have a little bit of a spiritual quality, it’s because of my teachers. I remember something His Holiness Dilgo Khyentse once told me. I used to be very wild, and sometimes people would report my actions to him in hope that he would scold me and discipline me. But instead, he would tell me who it was who told on me and would make a game of it. He used to say, “Don’t worry. You must remember that whenever there is one person out there who doesn’t like you or who thinks you are crazy, there will be a hundred people who are going to like you. And similarly, whenever there is one person who likes you, you shouldn’t get too excited about it, because there will be a hundred people who can’t stand you.” So liking and disliking are completely irrelevant. Kelly Roberts: Speaking of being wild, you talked on The Roseanne Show, as well as on NPR, about visiting strip clubs. I don’t know how many people would view that favorably. Why did you go? Dzongsar Khyentse Rinpoche: I didn’t have any profound reason. But it does show that you shouldn’t come to me if you are looking for inspiration. Kelly Roberts: Do you have any regrets regarding your film? Dzongsar Khyentse Rinpoche: A lot of regrets, but I think I will take the regrets as stepping stones for my further learning. Kelly Roberts: It seems that one of your aims in the film was to demystify the Western idea of Tibet and its culture. Why is this so important? Dzongsar Khyentse Rinpoche: Preconceptions are not so good because they always mislead you. Kelly Roberts: So you tried to show the ordinary side of monastic life and how that was profound. Dzongsar Khyentse Rinpoche: Whatever I do, I have no profound motivation. I just wanted to make a film. Kelly Roberts: But your film contained quite profound teaching. Dzongsar Khyentse Rinpoche: That depends on the person watching. Not everybody sees it that way. Maybe the success was just an accident. Kelly Roberts: You talk about your next film being the life of the Buddha. Dzongsar Khyentse Rinpoche: Only if I get enough money. Kelly Roberts: Isn’t The Cup making enough money to finance another film? Dzongsar Khyentse Rinpoche: No, not nearly enough. Not even 10% of what I need to make my next film. Kelly Roberts: So the life of the Buddha that you want to make is on an epic scale. Kelly Roberts: You must have done at least a hundred interviews by now. Are there any questions which you are surprised were never asked? 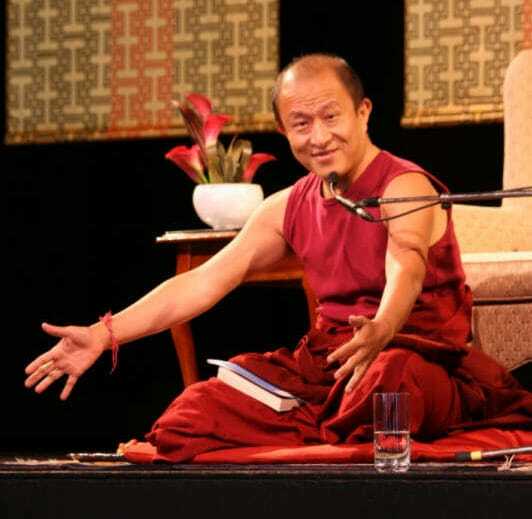 Dzongsar Khyentse Rinpoche: I am surprised that no one has ever asked if I’m gay or not. Kelly Roberts: Are you gay, Rinpoche? Dzongsar Khyentse Rinpoche: I have a tendency. Kelly Roberts: If you were going to ask yourself a question, what would it be? Dzongsar Khyentse Rinpoche: I only have one big fear, that’s all. Not a question. Kelly Roberts: What is your fear? Dzongsar Khyentse Rinpoche: As much as I want to be successful, I also have this growing fear that I will become a prisoner of fame. Kelly Roberts: If you could have anything in the world, Rinpoche, what would make you happiest? Dzongsar Khyentse Rinpoche: Spiritually, I would be so happy if I could see my twenty past lives and twenty future lives. That would probably give me some renunciation mind. On an ordinary level, I would be very happy if I could get my act together and finish the novels that I am writing. Kelly Roberts: I hear that you just offered 100,000 butter lamps at the Boudhnath Stupa in Nepal. What makes you happier, doing that or making films? Dzongsar Khyentse Rinpoche: I can definitely say that I am happier offering the butter lamps. Kelly Roberts: Thank you, Rinpoche. Dzongsar Khyentse Rinpoche: You’re welcome.